Meera Gorjala, an environmental studies and policy, planning, and development major at the University of Southern California, had only been exposed to state and federal government through her coursework prior to interning with the Fulton County External Affairs Department. During her time with the county, Gorjala learned about county government operations first hand, especially how various departments worked together in order to provide government services. 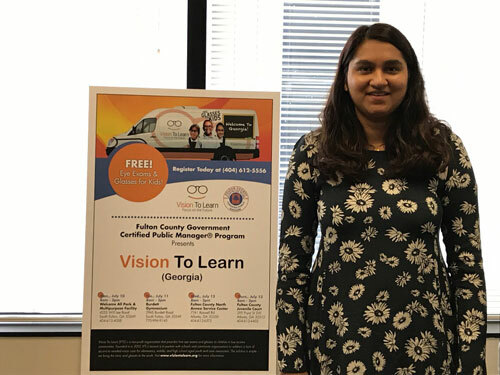 When asked about her core assignments, Gorjala responded that she had been tasked with scheduling eye appointments for children with Vision to Learn, helping to plan a Back-2-School Fair, creating an asset map, researching legislation that impacted the county, and analyzing the county’s nuisance policy. She was also afforded the opportunity to attend stakeholder and county staff meetings and interact with elected officials and county department heads. Gorjala counts several significant successes during her internship. She was especially proud of the work that she did on behalf of the Vision to Learn and Back-2-School Fair programs where she help provided much needed services for underserved kids in the community. Gorjala also expressed satisfaction with the creation of the asset map which includes all relevant information about nonprofit and other providers of direct services to the county. This map will be useful in fostering cooperation between the county government and the private/nonprofit section, especially when applying for grants. Attending meetings and tours, topped Gorjala’s list of the favorite parts of her internship. She had the opportunity to observe the Mayor’s Meeting where she learned about transportation plans for the county. She also was able to see a real world example of how the nuisance law that she researched functions when she attended the CID meeting for Fulton Industrial. The dialog from the meeting further allowed her to learn how businesses and government work together to help remedy problems in that area. When asked about what type of skills she learned from her internship, Gorjala remarked that she had a much better understanding of how to use Excel through her work with Vision to Learn and the asset map project. She further mentioned that her communication skills had been enhanced through having to interact with the public and she had a better grasp on how to juggle multiple responsibilities, which were skills she could carry with her to through any career path. Upon graduation, Gorjala plans on attending law school. Although she is not sure how she wants to use this degree, her experience with Fulton County and learning about the varied services and opportunities available has definitely put county government on the list of possibilities.